Birgir Freyr | Just some random stuff. I have an old Asus 17″ laptop which I use mostly for testing purposes and the other day I installed UbuntuStudio 12.10 on it. UbuntuStudio is supposed to be the complete and all around multi media creative suite. It comes pre-installed with Blender, Gimp, Inkscape, Darktable, Scribus, Ardour and I don’t know what. But what about me – what do I need? My main concern from when I installed ubuntu 11.04 has always been in regards to photography and the biggest hurdle in the beginning for me was color profiling the screen and raw conversion for Sigma Foveon files. Well as far as color profiling UbuntuStudio comes with gnome color management and DispalGui and I can even use my Spyder 2 color spider thingy, what ever you call it. So out of the box I could color profile the Asus screen, and jump right in working on photos in Gimp. 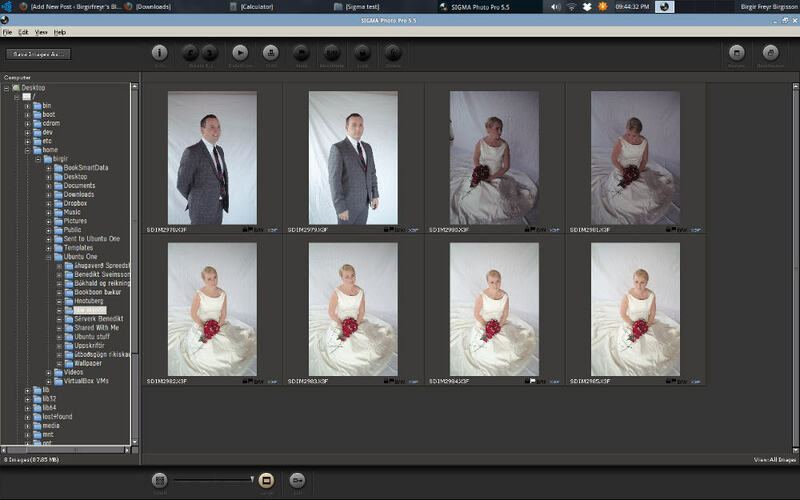 And after installing Wine, Sigma Photo Pro and Blurb bookmaker. I was in business. Hands on, how is it? UbuntuStudio uses the same window management as Xubuntu and it is light and fast on my 2006 Asus laptop. And genaraly speaking I liked it. It is also very convenient to get almost all the programs I use and loads more with just one install. I did however have to install Thunderbird and LibreOffice. It’s emphasis is clearly on visual, audio and video creation so it leaves it to the user to install the office application of choice. When it came to upgrading to 13.04 the upgrade process worked like a charm but for some strange reason the Nvida driver and screen resolution went of the grid so instead of trying to spend time trying to fix it I just decided to install Ubuntu 13.04. Don’t get me wrong I really enjoyed using UbuntuStudio and I would recomend it as you Distro of choice if Unity isn’t your thing, of course you could install any linux distro you like and install these programs yourself. 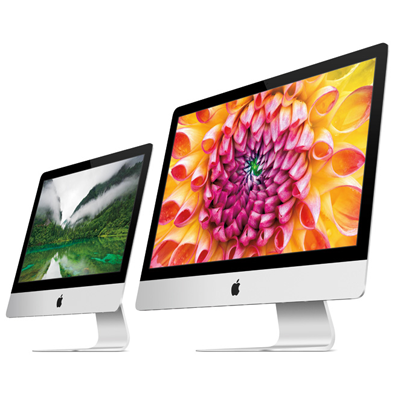 But to be able to install the Os and get all the creative program you could possible need has its own rewards. After installing 13.04 I have come to the conclusion that my old Asus with the Dualcore AMD cpu can’t really manage Unity without feeling sluggish and boring. So I started looking in to an alternative and I wanted it to be a lts version. More about that next time. I have decided to revisit my old post about enlarging photos with Gimp vs. Photoshop and Qimage since I found out there is a better way to enlarge photos, albeit more CPU heavy, in Gimp. In my old post I enlarged photos in Gimp using Cubic interpolation but after some reserch I have found out that Sinc (Lanczos3) does a far better job when enlarging. To check this out I decided to revisit the old test and enlarge the photo once more but this time with Sinc interpolation. As before I started out with the native resolution Sigma file and enlarged them in Gimp, Photoshop and Qimage. Lets see the results, you are looking at a small area in the print at 200% resolution or zoom in Gimp. The first photo is the one enlarged with Gimp using Sinc (Laczos3), then the Cubic in Gimp, then Photoshop and finally Qimage. Gimp enlarged with Sinc (Laczos3) interpolation. Qimage still creates the best version with a cleaner, sharper and less pixalated image. 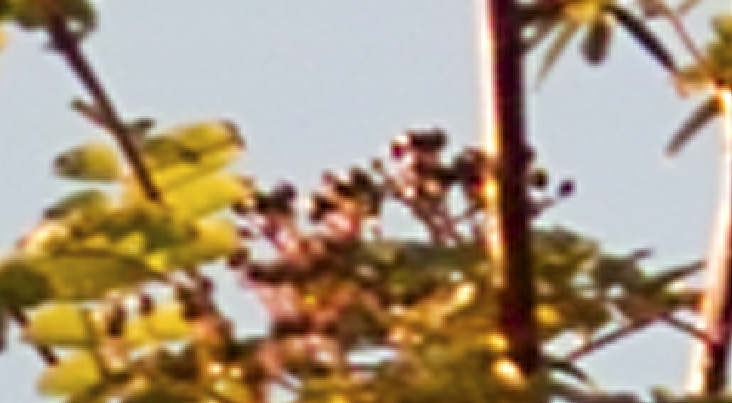 But Gimp using Sinc (Laczos3) interpolation is pretty darn close. Qimage still has the edge but by so little. The final output from Gimp using Sinc looks almost identical to the Photoshop version using Bicubic smoother. Have in mind I am using PS cs2 which is a rather old program and the new Photoshop version probably has something new when it comes to enlarging. 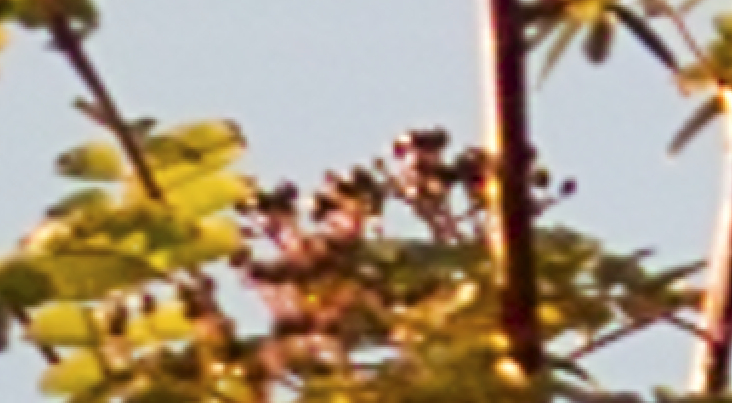 But why bother when Gimp can produce excellent result with Sinc interpolation almost rivaling the result from Qimage. I also did a print test on photographic paper via Epson 1270 printer and from a normal viewing distance it was hard to tell them apart but there is a small difference. The Gimp and Qimage prints are very close and I see no need to use Qimage over Gimp for enlarging photos. If you want to redo this test you can download the original Sigma file in it’s native resolution. Now I have no longer a need to get Qimage to work on Ubuntu via Wine. It just no longer is an issue. When I first started my little Linux journey or better say Linux experiment in may 2011, I set a few goals. My intention was to see if I could switch my photographic work entirely over to Open Source programs. I had to be able to process my Sigma .x3f raw files, had to be able to color correct my computer screen and be able to create blurb books. Now almost two years later I can finally say “mission accomplished”. Yes I can finaly use my very special Sigma photo pro Raw converter made by Sigma. I did try many linux based raw converters like RawTherapee, Rawstudio and Darktable but only RawStudio could process my raw files and did it rather poorly. I did try installing SPP via Wine but to no luck. So what did change. I meet a guy on the DpReview Sigma forum who had succesfully installed SPP via Wine from day one. With his instruction I finaly cracked it. SPP works flawlessly. So far I have proccesed a few files with no problem. So this is truly good news. I am getting closer to never needing to buy another Windows OS. The Last computer I bought I had to fork $160 for Windows 7 Home Edition. But that isn’t all. There are more good news. After playing around with a few Linux distros I decide to try UbuntuStudios and I must say that Ubuntu Studio is great. It has all the programs I need along with a bunch of programs for audio and video editing which I would really like to learn. But the suprise came to me when I was using my Color spyder 2 and trying to install the windows Spyder color profil program with wine and I just for the heck of it tried running the spyder 2 instrument in DispalGui. And to my surprise it worked. I could color correct my 2006 Asus 17″ laptop with the Spyder using DispalGui. The profile didn’t look perfect and I am going to try this also on my new System76 laptop but the future looks bright. I also plan on buying the ColorHug from Hughski which I hope is going to work better and faster. It took DispalGui 70 minutes to go through its process. What about the photo books. I installed Blurb with Wine and it is a bit buggy but it is operational, I can make books and send them to blurb for printing. Hopefully Scribus will do the same for me since I am not very happy with Blurb since I am stuck with there program to print my books. In other words I am locked in, Books I make with the Booksmart Software have to be processed with Booksmart and there is no option to expert as pdf to print somewhere else. The bottom line is I can say goodbye to Windows. Just need to convince my wife. One thing I have to do more often then not is enlarge my digital prints for printing. Unlike with traditional film which you can scan on a flatbed scanner and get incredible resolution for printing, I have to use Gimp or Photoshop to enlarge my prints for the final print size. Most of the time I am not enlarging my prints by that much but since I am using the Sigma Sd-14 Digital camera with the Foveon censor and it only has 4.6MP I have to enlarge most of my prints by some degree for printing. The Sigma Foveon digital files do enlarge extremely well and outperform other cameras with higher Megapixels count. But what if I wanted to make a print 63x42cm? Enlarging a digital SD-14 file from 2640×1760 pixels (4.6mp) to 7500×5000 pixels (36mp) is no problem for Foveon but I need a program to enlarge the print. How well will the open source Gimp performe up against Photoshop CS2 and Qimage (version. 2010.210)? Well lets find out. I started out with the native resolution Sigma file and enlarged them in Gimp, Photoshop and Qimage. Lets see the results, you are looking at a small area in the print at 200% resolution or zoom in Gimp. Qimage creates the best version with a cleaner, sharper and less pixalated image. Gimp comes second and then Photoshop. But have in mind when I enlarged the file in Photoshop I used Bicubic sharper setting instead of Bicubic smoother. When I enlarged the file in CS2 via bicubic Smoother it created a better photo than Gimp. But not by much. Does this mean Gimp is crap? No not at all, the difference was minor and hardly visable. When I printed these files on photographic paper via Epson 1270 printer and from a normal viewing distance it was hard to tell them apart but there is a small difference. 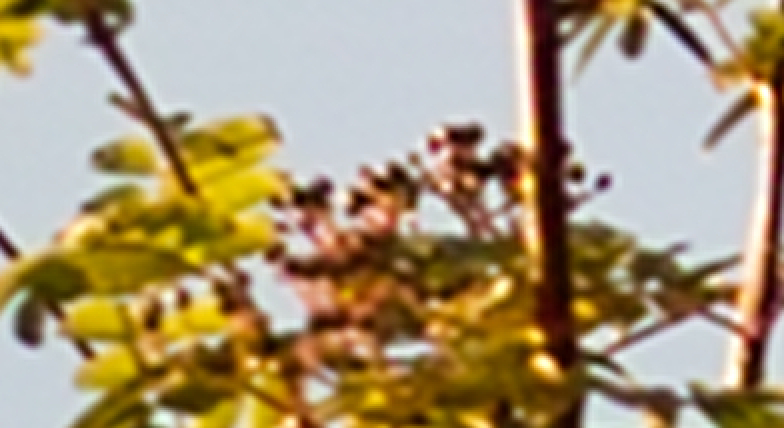 The Gimp and Photoshop image look the same while the Qimage program clearly does a better job. If you want to make your own print and download my A4 test print which I used for evaluation. The test print show the three version at print resolution of 7500×5000 but only the area I was looking at. Also if you want to redo this test you can download the original Sigma file in it’s native resolution. Now I only need to get Qimage to work on Ubuntu via Wine. Yes it has been a long time since I bloged and the reson for it is a happy one. My daughter was born june 29th. So running a home with a new born and a 2 year old is full work. But many interesting things have happened. Ubuntu 12.10 has been released but so far I haven’t upgraded. Why you ask? Well Eee I just haven’t seen any resaon to so far. The difference between 12.04 and .10 seam minor. But however I have noticed something strange going on with Libre Office 3.6 which I manually upgraded on Asus running 12.04. It seams when I open a .xml excel document, did a few changes and added comments to explain my changes and after saving the comments disappear! Very strange. Maybe I just should have stayed with 3.5. The other day I was talking to a big company about Free Software and one of the things which always get’s mentioned is compatibility issues between LibreOffice and Microsoft Office. And I get ghost story’s about documents which people were recording changes (track changes) and adding comments and then púff, gone like my money in the special stockmarked saving account. Educating people about LibreOffice is clearly the most important thing to do when company’s migrate to Free Software. There was a report in Iceland not long ago about how much cost the Icelandic parliament spends on paper printing and copying, which is about $236.000 a year. The report asked the question why not buy an Ipad for every member of parliment which would kost about $48.000 in the first year and then saving after that. As the report did say we can never just drop printing and zerox copying paper in the parliment of Iceland but I wondered why on earth is everybody so fixed on Ipad as the solution for everything. Why should they lock them in using proprietary devices when they could have bought Asus x101 netbooks for $21.990 and install Ubuntu on them and have a far better keybord and a much more functional device that does not lock the Parliament of Iceland with proprietary devices. Now who do I have to sent this letter to?